Under the combination of elevated temperature and mechanical loads, structural members tend to creep. Basic laws of creep are presented, and the effect of temperature changes in the constitutive law of creep is discussed. The rheological models of two important engineering concepts of stress, namely the load- and the deformation-controlled stresses, are presented. The chapter concludes with the description of numerical techniques of solutions to creep problems. 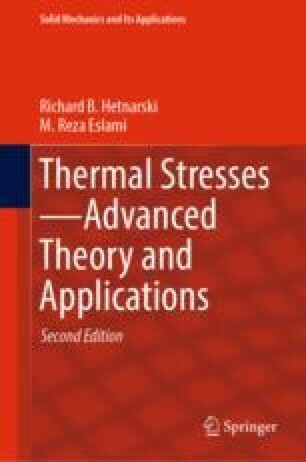 The nature of pure thermal stresses as the deformation-controlled stresses is presented in the example problems. It is shown that pure thermal stresses relax as the time advances.